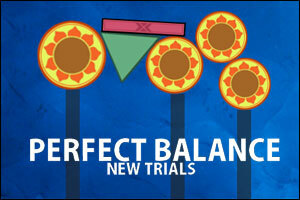 If you enjoyed Perfect Balance then prepare yourself for more challenges with Perfect Balance New Trials! This sequel by Ville Helin aka ttursas features 30 new “brain taxing trials”. The goal remains unchanged: rotate and stack shapes, and try to achieve perfect balance! Perfect Balance – New Trials video walkthrough! Kondr, that lv. 20 balance is amazing! I am still trying to figure out lv.19. Pretty nice game. kondr-IMPRESSIVE!!!!! !OMG HOW DID YOU DO THAT?? gonna sound dumb but… how do you get past level 1? Posted on Wednesday, March 18th, 2009. Follow any responses through the RSS 2.0 feed.